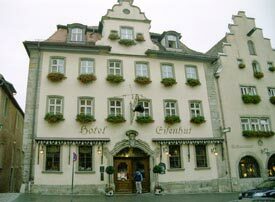 ABOVE: The Hotel Restaurant Eisenhut has one of Rothenburg's most highly-regarded kitchens. Thanks to its popularity as a tourist destination, Rothenburg is well supplied with dining options--everything from upscale hotel dining rooms to moderately priced Greek, Italian, and Chinese restaurants. There was even a McDonald's in the Obere Schmiedgasse the last time we checked (sorry--no drive-through window). The Mittermaier Restaurant and Hotel offers a modern, light style of Franconian cuisine that makes use of fish and other local ingredients. The presentation is as imaginative as the cooking, and the cooking is nothing short of superb. The Hotel Restaurant Eisenhut has an excellent dining room. In summer, the hotel's L�wenbr�u beer garden offers barbecued meats, Franconian specialties, and snacks outdoors. One-, two-, and three-night packages include one or more dinners and the hotel's first-rate breakfast buffet. The Altfrankische Weinstube is one of the coziest and friendliest places in town. Prices are moderate, and you can order a full meal or traditional German snacks to go with the local wines (which are available by the glass). If you're homesick for nachos, chili, or chicken wings, head for the Molkerei Bistro Musikcafé, which also has sandwiches, Schnitzel, spaghetti, and billiards or darts to keep you occupied while you're waiting for your order.